The Drill ODBC Driver installer is available for 32- and 64-bit applications on Windows. On 64-bit Windows operating systems, you can execute both 32- and 64-bit applications. However, 64-bit applications must use 64-bit drivers, and 32-bit applications must use 32-bit drivers. Make sure that you use the driver version that matches the bitness of the client application machine. Currently Drill does not support a 32-bit Windows machine. However, the 32- or 64-bit Drill ODBC Driver is supported on a 64-bit machine. Currently Drill does not support a 32-bit Windows machine; however, the 32- or 64-bit Drill ODBC Driver is supported on a 64-bit machine. 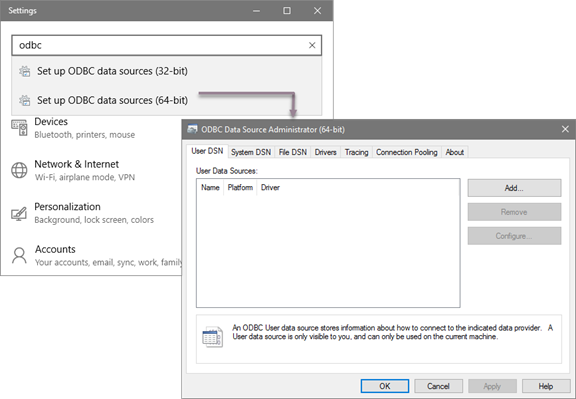 Download the installer that corresponds to the bitness of the client application from which you want to create an ODBC connection. The current version is 1.3.8. Double-click the installer from the location where you downloaded it. Select the check box to accept the terms of the License Agreement and click Next. Verify or change the install location. Then, click Next. 1. Go to Settings and enter odbc. 2. Select Set up ODBC data sources <version>. The ODBC Data Source Administrator <version> dialog appears. Click the System DSN to view the Drill data source. 3. 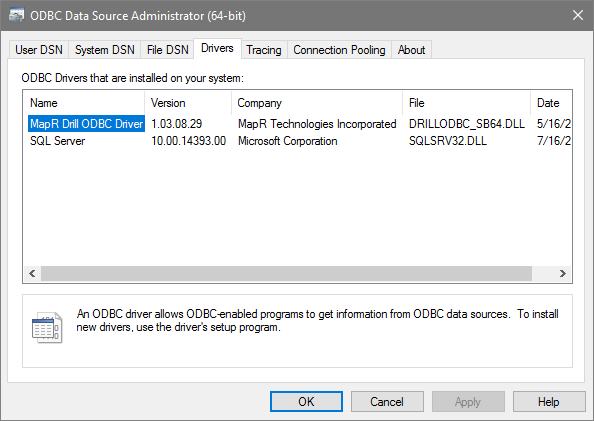 Click the Drivers tab and verify that the Drill ODBC Driver appears in the list of drivers that are installed on the computer. 4.Configure and start Drill before testing the ODBC Data Source Administrator.